The romance of the Scottish Highlands is alive and well in this authentic kilt, kilt skirt, and bonny Prince Charlie jacket and vest. To complete the ensemble, knit the lacy vest for women and the argyle socks for men. 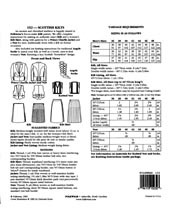 Pattern includes complete instructions for measuring, pleating, and constructing the Kilt and Kilt Skirt; pattern pieces for cutting out and instructions for sewing the Jacket and Vest. 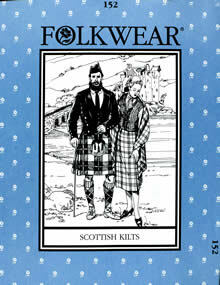 Kilt, all sizes. Jacket and vest, Men's 36-48. Knitted vest, Misses S, M, L.